This Tibbit is capable of generating up to 15mA of +15V power and 15mA of -15V power from the main 5V supply rail. This Tibbit, therefore, does not rely on the outside power but instead generates +/-15V from the internal main power of the TPS. The diagram in Tibbit Power Lines actually shows Tibbit #12 and its "power relationship" with other Tibbits. Multiple Tibbits #12 can be used to increase available +/-15V current budget. 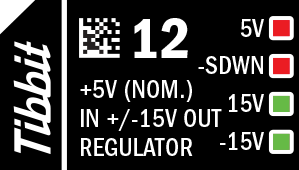 The module is required for the correct operation of Tibbits #13 (ADC) and #14 (DAC). This Tibbit has a base (idle) power consumption of 230mA. Each additional mA of current consumed on the +15V and -15V outputs results in 4.5mA of extra power drain on the 5V input. This 4.5 ratio is explained by the threefold difference in the input (5V) and output (15V) voltages, as well as associated power conversion losses. There are two red and two green LEDs. The first red LED is connected to the +5V input. The second red LED is connected to the -SHUTDOWN line and lights up when the line is LOW (i.e. when the module is in shutdown). Green LEDs are +15V and -15V power indicators. * "Mates" in this case means "doesn't mind them close" as this device requires no connector Tibbits for its own operation.